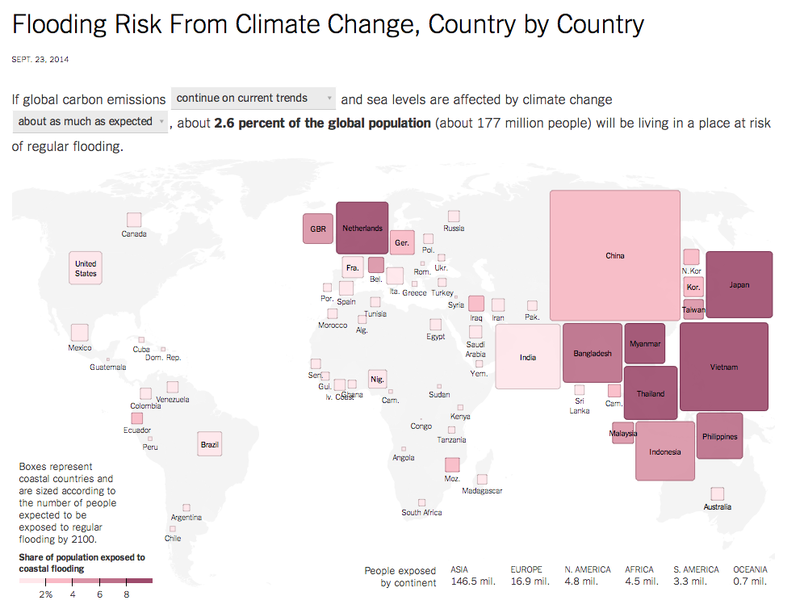 NY Times cartogram for visualizing potential flooding impact of climate change. Climate change has become a hot-button issue in recent years with both sides of the political spectrum chiming in with opinions and scientists providing data about the legitimacy and potential impact of climate change on the Earth. One such scientific study by Climate Central resulted in estimates for populations of countries that could be affected by flooding. These estimates take into account future potential trends for global carbon emissions and future potential affects by climate change on the sea levels. This entry was posted on Tuesday, October 28th, 2014 at 12:47 pm and is filed under DATA VISUALIZATION. You can follow any responses to this entry through the RSS 2.0 feed. Both comments and pings are currently closed.